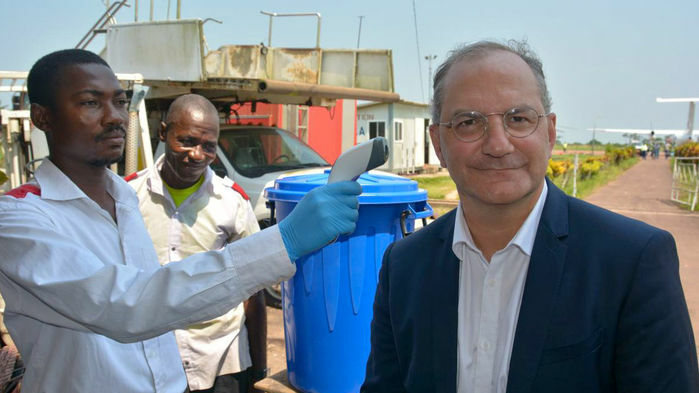 One week after celebrating the end of a potentially explosive Ebola outbreak in Équateur province in the Democratic Republic of the Congo (DRC), Peter Salama received startling news: It was time to again pack his bags and help mount yet another counterattack against an apparently new outbreak in the same country. Salama, an Australian epidemiologist who heads the Health Emergencies Programme of the World Health Organization (WHO) and is based in Geneva, Switzerland, says he is “more concerned” about the new outbreak—in North Kivu province, 2500 kilometers east by road of the previous one—because it appears to be growing rapidly, has already reached a city, and is in a conflict zone with many armed insurgents and refugees. Local health officials first suspected the emergence of Ebola after a 65-year-old woman in the village of Mangina had classic symptoms of the disease, died, and was buried in an unsafe manner, which apparently led to the infection and death of seven of her relatives. Confirmed cases already have been found in Béni, a city 30 kilometers from Mangina that is home to some 350,000 people and only 50 kilometers from the border with Uganda. An experimental vaccine exists but despite performing well in a clinical trial held in Guinea in 2015, it has yet to receive regulatory approval in any country. Under “compassionate use” regulations that require formal research protocols, the DRC’s Ministry of Public Health together with Salama’s team and Doctors Without Borders staged what is officially a clinical trial of the vaccine in Équateur. None of the 3300 people who received it developed Ebola. (There was no control group, which would be unethical after the successful study in Guinea.) The Ministry of Public Health says it still has 3220 doses of vaccine in Kinshasa and plans to send them to North Kivu if sequencing confirms, as expected, that the virus matches the one used to make the vaccine. Earlier today, Science Insider spoke with Salama, who is leaving for the DRC on Thursday. This is a condensed, edited version of the interview. Q: What did you first think when you heard about this outbreak? A: My first response was, “I hope it’s not another one.” We’ve just come out of last one, and we’ve been working around the clock since May. Q: This appears to have spread to more people and to more places than in the first few days of the confirmed Équateur outbreak. Why? A: The probable and confirmed cases are in the range of 400 square kilometers, which is not that huge, but it’s an area with some big roads—it’s easy to travel from Mangina to Béni. And this is over the course of 3, 4 weeks. It’s also a very mobile population: One million of the 8 million people in North Kivu are displaced, and there’s lots of commercial activity. Q: Assuming that this outbreak is separate from the one in Équateur, the DRC has only had 10 outbreaks since 1976 and now one occurs on the heels of another. What’s going on? A: I don’t think we can read a trend into two data points. A few things are very interesting scientifically. If it turns out to be Ebola Zaire, it’s the first time we’ve had Ebola Zaire in this part of the DRC. It’s the first outbreak in the Kivus, and if you had to anticipate an outbreak in Kivu, most people would have thought it would be Ebolavirus Bundibugyo or Sudan, which both have been in Uganda. That’s interesting and begs a series of scientific, epidemiologic, and zoonotic questions. If it does turn out to be very a similar sequence to Équateur, we have to interpret that cautiously. It’s unlikely that it was spread by humans, but it could mean fruit bats have moved the virus over from one side of the country to the other. We can read a trend into what’s happening more broadly beyond Ebola. We’re starting to see a worrying occurrence with different outbreak patterns because of climate change, changing animal reserves, population growth and concentration, population displacement, and humans abutting on different animal territories. This trend toward outbreaks in urban areas is gravely concerning. Q: What most worries you now? A: Béni is very close to Butembo, a commercial center with a lot of trade that has a population of 800,000 to 1 million. And Béni is on the road to Goma, another major population center, where we’ve already had suspected cases. Superspreading in a village might mean seven people in Mangina with an unsecured burial. In an urban area, it might mean one person going to a shopping center and affecting 1000. That’s going to be a trend we’re going to have to grapple with for years and decades to come. Q: What are the security issues? A: There are 100 insurgent groups in the area and 20 are highly active. There have been targeted attacks on peacekeepers, as recently as July. We’ll have to travel with armed military escorts to do surveillance. Q: The vaccination strategy calls for targeting people who have come in contact with confirmed cases as well as contacts of the contacts, to create a “ring” of protection. How does the volatility of the area affect those plans? A: We’re asking whether ring vaccination is the only possible implementation strategy. If for security reasons we have areas that are blackouts and we can’t do extensive contact tracing, we’re asking [WHO’s Strategic Advisory Group of Experts on Immunization] to consider whether they would recommend use of the vaccine still under geographic targeting protocols. So, if a village had 20 cases and 300 people, could we just vaccinate those 300 people? Especially if we have time limitations of how long we can be in a place because of security concerns. And if we go for geographic targeting instead of ring vaccination, we may need far more vaccine. Q: And there are additional doses of vaccine in the United States with Merck, its manufacturer? A: Yes, and there are up to 20,000 doses ready to be exported. Q: A WHO expert panel in May supported the use of four experimental Ebola treatments during the Équateur outbreak, but none was tested. Are they being considered now? A: We’re very keen to ensure the drugs are used, and if possible, we’ll look at research protocols. There’s not a lot of data with any of the therapeutics, but we want to make sure people get access if someone is unfortunate enough to get Ebola. Q: Are you at all frustrated that the regulatory process is taking so long to license the vaccine? A: Do we want to accelerate the process of getting a licensed Ebola vaccine? The answer is absolutely, yes. There’s also an interim option to use the vaccine without a research protocol under what’s known as the Emergency Use Assessment Listing. We’re pursuing that. A: It would be very important if ring vaccination became more complicated or if we had cases in surrounding countries that have trouble approving research protocols, like South Sudan. But one issue is liability and insurance. Under research protocols, we have clear insurance in the case of adverse events to indemnify the countries. With the Emergency Use Assessment Listing, those don’t apply. We’re working very hard to get an insurer. Q: Who is paying for this response? A: That’s a very good question. WHO has made available $2 million from our contingency fund to kick-start responses. But we haven’t yet finalized our appeal to donors. We do have a small amount of leftover funding from Équateur. We’re negotiating with donors, including the Wellcome Trust, if we can repurpose that money. Q: Given the proximity to Uganda and Rwanda, is there a discussion about whether to declare this a Public Health Emergency of International Concern, which kicks in when diseases are likely to cross borders? A: It’s definitely something we’re actively considering, but at this point, we don’t have enough epidemiological data so it doesn’t warrant calling an Emergency Committee meeting.